The glass is two-and-one-half inches tall, one-and-seven-eighths inches wide at the top, and one-and-nine-sixteenths inches wide at the base. Warsaw, Illinois, is a central Illinois town of about 1800 people, situated on the east bank of the Mississippi River in Hancock County. Although the town was founded in 1834, its pre-history dates back to 1814, when Major (and future United States president) Zachary Taylor founded a federal military outpost at the site of the future town. Called Fort Johnson, it was occupied only a month before it burned down, but another military camp, Fort Edwards, was built there in 1816. Fort Edwards became an important fur trading post and one of the earliest settlements in Western Illinois. It was eventually abandoned in 1824. 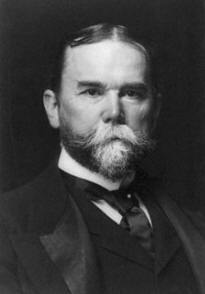 John Hay, whose picture is shown at left above, must be Warsaw’s favorite son (sorry, Steve). 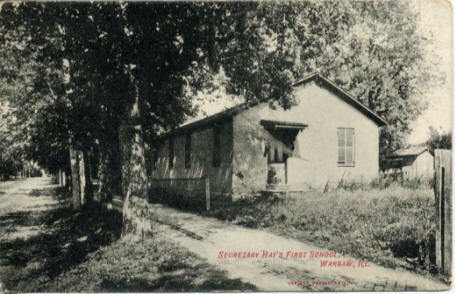 The1910 postcard shown alongside (above right) features Hay’s first school. Warsaw can boast of three architectural wonders. 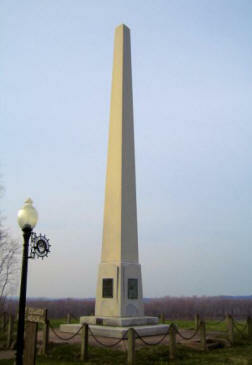 The first is the Fort Edwards State Memorial, a 45-foot-tall obelisk that was erected in 1914 (right). The second is an 18-foot-tall replica of the Statue of Liberty (below). 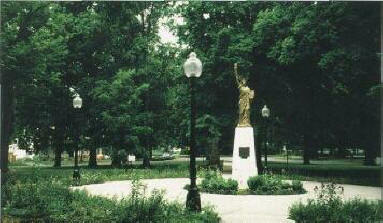 Frank Connor, a successful Chicago businessman, purchased the statue and had it placed in the town’s Ralston Park. It was dedicated to the Boy Scouts of America in 1950. This Popel & Giller glass clearly indicates that the two men were distillers. But the spirits business was not their only occupation. Warsaw’s third architectural wonder is the Popel and Giller Brewery building. Here is both the building and its timeline. 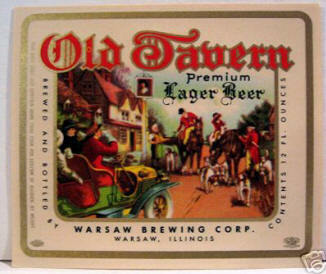 1860 – Rudolph Giller establishes his brewery at 920 N. 6th Street in Warsaw. 1861 – The brewery is sold to Martin Popel; it is renamed the Martin Popel Brewery. 1880 – John H. Giller becomes a partner; the brewery is renamed: Popel & Giller, Warsaw Brewery. 1906 – The name is shortened to Popel-Giller Co.
1935 - The brewery opens up and is renamed the Burgemeister Brewing Co.
1936 – The brewery is renamed the Warsaw Brewing Co.
1938 – The brewery is renamed the Warsaw Brewing Corp.
1970-72 – The brewery also does business as the Crown Brothers Brewing Co.
1972 – The brewery closes again. 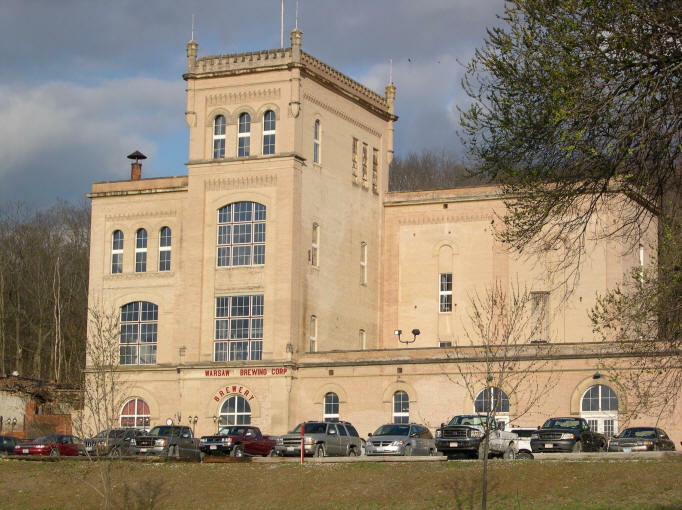 2006 – The building opens up as the Warsaw Brewery; it is now an upscale bar, restaurant, and banquet hall. This massive building is not the only remnant of the brewery’s former glory. 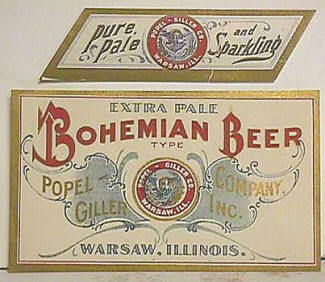 For example, this Bohemian Beer label (below) preserves the Popel-Giller name. 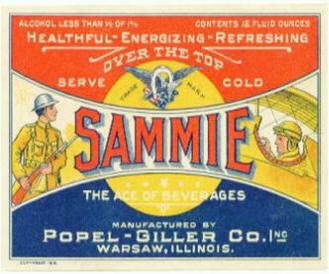 This “Sammie” label is an example of an early Prohibition label. By now, “beer” is both literally and figuratively a four-letter word; its use is forbidden. The alcohol content is less than one-half of one percent. The beverage is no longer brewed; instead, it is “manufactured.” Finally, note the World War I theme. When the brewery opened up in 1935 as the Burgemeister Brewing Co., it established the Burgemeister and Old Tavern brands. Here is a bottle opener of the former and a label of the latter. Finally, here are two old Popel and Giller beer bottles. But enough about beer. What about the shot glass? I could find no evidence that Popel and Giller ever distilled whiskey. Perhaps these “fruit brandies” they advertised were a sideline to their brewery business. The name on the glass is “Popel & Giller.” The timeline suggests that this glass dates from 1880 to 1906. This glass, though modest in appearance, appears to be quite rare. Since Robin began keeping records, it has appeared only once on eBay, in August of 2004, where it garnered a very respectable, if not remarkable, $75.89. At the time, I watched the bidding escalate back and forth between two individuals who clearly had never heard of sniping, but instead were both determined to win the glass at all costs. I next saw this glass at the St. Louis bottle show last year. (Who knows; it might have been the same glass that I saw on eBay in 2004.) I probably would have purchased it at the show, but lakerdude33 saw it first and beat me to it. Months later, when he was in a feeding frenzy over labels-under-glass, I bought it from him. Popel and Giller were distillers, but to date it appears that no one has uncovered a true pre-prohibition whiskey (not fruit brandy) shot glass that bears their name. Who knows, perhaps some day a Popel and Giller “Warsaw Whiskey” shot glass will appear at some farm auction in Central Illinois. If it does, it might well be the find of the year. Copyright © 2008 pre-pro.com. All rights reserved.